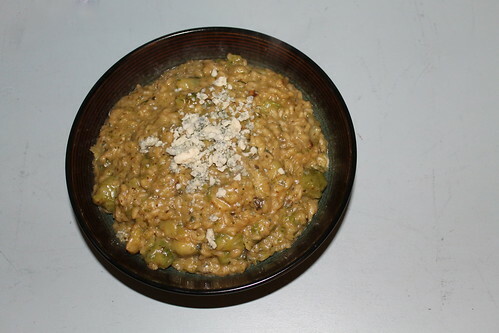 If I discover a combination of flavors that I love, and one of those flavors is a cheese, they will inevitably make their way into a risotto together. That's just how I roll. Last year, the obsession was pumpkin and goat cheese. Risotto recipe here. Lately, I've been really into pairing Brussels sprouts with gorgonzola. First, I should say that if you think that you don't like Brussels sprouts, you are almost certainly the victim of bad Brussels sprout PR. You've had them boiled or steamed. You hated them and I don't blame you. Brussels sprouts need to be roasted, sautéed, or caramelized. When cooked with indirect heat, they get bitter and slimy. When browned with direct heat, they sing. 01. Trim stems off Brussels sprouts and cut each one in half. Sautée in olive oil over medium heat untill browned in places. 02. In a separate pan on an adjacent burner, bring broth to a simmer..
03. 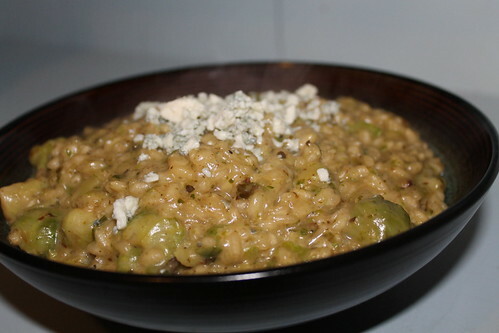 Add arborio rice to the Brussels sprouts and oil, stirring to combine so the rice is evenly coated. 04. Keeping the broth at a simmer, add a ladle-full at a time to the rice mixture, stirring constantly. As each ladle-full is absorbed, add another, stirring constantly until the rice is al dente. This may use less than the total amount of broth or it may use the three cups exactly. If you need more, add boiling water from a tea kettle after the broth is used up. This whole process takes about 20-30 minutes of stirring. It's what intimidates most people about making risotto from scratch, but I find that it can be quite relaxing if you remember to be patient. After all, it's not complicated; it just takes time. 05. Take the risotto off the heat. Season with salt and pepper, and stir in the gorgonzola, reserving some for garnish if you so desire.